Take a short survey about our community (it's less than a minute!) for a chance to win one of three $100 gift cards. Survey ends on March 1, 2019 at 8 p.m. Good luck! 3. WHICH ORGANIZATIONS, NON-PROFITS OR INITIATIVES ARE YOUR FAVORITE(S)? 4. WHICH ORGANIZATIONS DO YOU FIND MOST VALUABLE? This promotion is in no way sponsored, endorsed or administered by, or associated with, Facebook. You are providing your information to Old Mill District and not to Facebook. 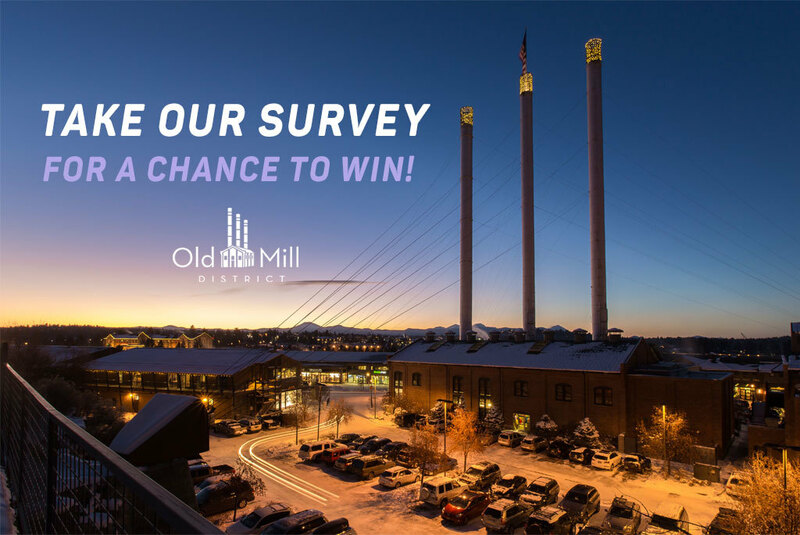 The information you provide will only be used for Old Mill District's purpose. The survey closes on March 1, 2019 at 8 p.m. We'll announce the winner on March 2, 2019. The winner will be contacted via email and phone. Good luck!